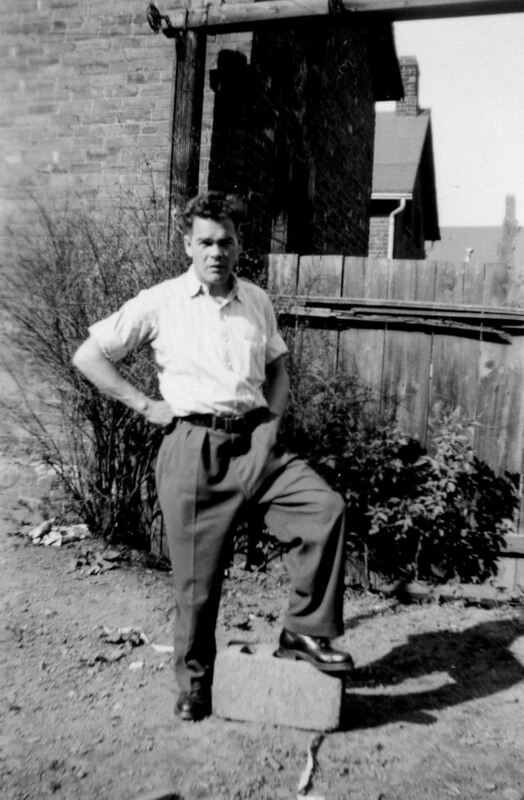 Today would have been my Dad’s 98th birthday. Unfortunately, he didn’t even get to see his 56th. He died on April 29, 1969, three months prior. I was twelve then. My mother was widowed at the age of thirty-nine. 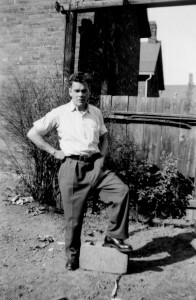 My Dad was one of the thousands of British Home Children sent out to Canada between 1861 and 1938. He, two brothers and one sister came through The Orphan Homes of Scotland between 1922 and 1930. Unlike so many others, he never hid the fact he was a Home Child and in later years, I’ve done much to honour the memory of those youngsters who came so long ago. I’ve had articles published on the subject, here and in the US. And most recently, a story specifically about him in Leopard Magazine in the UK. He was always modest and never one to toot his own horn so that one would make him uncomfortable, I think. But to me he was special and always will be. In 2001, I was involved with an exhibit in Glasgow called The Golden Bridge because of my Home Children ties. When I found out my Dad’s story was going to be one of the featured exhibits, I was there. I’ve honoured him and his memory in other ways, too. My oldest grandson was named after my father. My son’s middle name was my father’s. I’ve set my novels in the area of Scotland where he was born and have spent time in that area. When my husband and I celebrated our 25th wedding anniversary, we renewed our vows in the church at Quarriers Village (formerly The Orphan Homes of Scotland). I know he’s watching over me. Sometimes, I feel him at my elbow when I’m writing… and with some of the material I’ve written likely quite mortified by it all. But still, I’m doing what I want to do and he’s happy for me for doing it. As I do every year on Father’s Day and his birthday, I’ll be making the trek to the cemetery to spend some time with him. The Thousand Islands Writers Festival will hold their first annual Storefront Writing Contest, Saturday August 27th, 2011 in downtown Brockville. Patterned after a similar contest in Bruton, England the contest will pair individuals who write from downtown storefronts creating short stories of approximately 2,000 words in the genre of their choice. Participants meet at the Brockville Library at 9:30 a.m., on contest morning to register. Store locations and prompts for the contest will be randomly drawn. Writers will proceed to their chosen sites to begin writing at 10:00 a.m. until 4:00 p.m. Completed work will be turned in at the Grindstone Tapas Lounge with a post-contest social hour. Entries can be produced by pen or laptop. Laptop users are asked to bring a memory device to download from. Participants are encouraged to dress in period costumes, but it is not necessary. The entry fee is $5. The deadline for entries is Friday August 19th, 2011. Entries should include the participants name, address, phone number and e-mail address. Drop off is at Leeds County Books, 73 King St. W., Brockville or mail to Thousand Islands Writers Festival, 13 Duke St, Brockville, Ontario K6V 3J2. Further details may be found at www.tiwfestival.org. 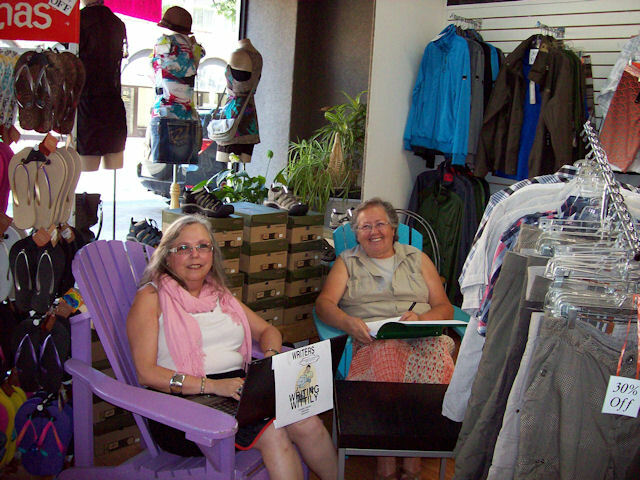 Here we are comfortably ensconced in the brightly painted Adirondack chairs at Echo Clothing in Brockville, one of the proud sponsors of the Thousand Islands Writers Festival Storefront Writing contest. Even folks without laptops are welcome to join in the fun on contest day, as demonstrated by Dorothy. Handwritten entries will be accepted. The official press release is coming soon followed within a couple of weeks by Doreen Barnes’s article in the St Lawrence EMC newspaper. Chris contacted me yesterday to say his book is back up on amazon.com after having to take it down temporarily to remove one of the short stories since an editor had decided to buy it. Congrats on the additional sale, Chris. You can download In A Flash for the Kindle here for $2.99 US. Good luck Chris. We wish you many sales. As loveahappyending.com featured Author Richard Holmes releases Angelic Wisdom Trilogy it is a day that marks another step in his career as an author. This new book combines three of Richard’s earlier volumes and has been updated. There are 2 copies of the original Angelic Wisdom Vol 2, waiting to be won. It will give you a feel for this exciting triology. Simply Email us at lovehappyending.com@gmail.com by 25 July 2011 asking to be entered into the random draw and sending Richard your good wishes. This wonderful trilogy of angelic insights started life back in 2002, and was originally three separate volumes. It is a delightful piece of work that allows the reader to take a peek into the very souls of these truly amazing celestial beings that we like to refer to as angels. The first part of the book goes into great detail as to how the angels function and what they actually do for the Earth and mankind in general. Part two gives a deep insight into spiritual (natural) law and answers the kind of questions that tend to keep the average mere mortal frustrated and in the dark. For example, have you ever wondered why you continuously seem to attract the same kinds of people into your life that always causes you hurt and pain? This question and many more are dealt with within the pages of part two. There are also question and answer sessions in parts one and two, between the author and his celestial guardian, that are both thought provoking and interesting to say the least. Finally, part three consists entirely of such a session and deals with matters that the author felt remained unanswered from the previous two volumes. This book will change your life; you can’t afford NOT to read it. Miracles are everyday occurrences and are living proof of God’s love and grace. A miracle can happen anytime, anywhere and such events demonstrate the extent that God will go to, in order to express his love for mankind. So what is a miracle? It is an event that occurs in seemingly impossible circumstances; a happening that defies all logic. Humans experience miracles on a daily basis, but are oblivious to the majority of such Divine occurrences. Miracles happen because mankind constantly requires proof and confirmation that God really does exist. How then can we in the angelic realms describe a miracle to you? How can we convince you that miracles really happen? You are probably thinking that this is not possible, for many of you will not be aware of experiencing miracles first hand, and you are probably waiting for us to give examples. The best example that we can give you, dear reader, is the example of how you came to be reading this book. Each and every one of you has a story to tell, each and every one of you has walked a pathway of many lumps, bumps, twists and turns. Indeed many of you will think it is an absolute wonder, a miracle, that you now read literature such as this. As you cast your mind back over the years and think on the journey that has brought you to this book, I’m sure you will agree that it is nothing short of miraculous. Look around you at nature, the different life forms, the trees, the vegetation, the wonderful colours and smells, is this not all miraculous? Indeed life itself is a miracle, the very air you breathe, the sunshine, the seasons, all are miraculous. Once you grasp an appreciation of all these things, then your whole life will be one miraculous experience for you. Miracles are not impossible events. They are everyday occurrences and demonstrations of love in action, love in motion. When you understand the miracle that is your life, and when you are truly grateful for all that life gives you, then, and only then, can you say that you are on the right pathway to self-realisation. The Law of Miracles decrees that when you truly walk a pathway of light, you understand that everything in your life is a gift from God, a miracle. Armed with this wisdom your life becomes bliss – which is the ultimate miracle. God bless you. Intention is probably the most important thing in any thought, feeling or deed that you conceive, in that it is the intention behind the thought, feeling or deed that determines the outcome. The outcome in this case meaning the level of cause and effect. There have been many deeds carried out with good intentions that have not yielded desirable results. However, this does not necessarily mean that the perpetrators have acquired a degree of negative karma by their actions. It is what is in your heart that counts. Your intentions count for everything, and this is a very important truth to grasp for all those who seek a pathway of light. Once you conceive a thought there is a simultaneous interaction between the mind and the heart. In this minute moment in time, your intentions behind the thought are determined. Remember, we have spoken previously about today’s thoughts being tomorrow’s reality. As soon as the thought is conceived it goes out into the ether and will manifest itself at some stage or other. This means that if you have a thought based on good intentions, but for various reasons forget to carry out the actions behind the thought, there is every chance that the manifestation of the good actions will take place anyway. For example, if you know of someone who is under the weather and needs healing, it may be your intention, via your thoughts, to send this person absent healing (please see the section on healing for an explanation of this). If you then forget it won’t matter because the thought has already gone out into the ether. Your angels in the higher spiritual realms will pick up on this and act in accordance with your thoughts. Everything is created by the thoughts of man. Humans create all situations for themselves by the power of their thoughts. Life on the Earth plane is most definitely an illusion, but the actions of humans are the product of previous thoughts, which in turn became feelings and then actions. Today’s thoughts create tomorrow’s life; we have stated this on many previous occasions. Humans are slaves to their own thoughts. The human mind will “steal” your happiness and create for you unhappiness based on illusion. By the same token humans can also experience joy whilst on Earth. The thing to remember is that matter is constantly in motion and is driven by the thoughts of humankind. It’s like a child having a piece of plasticine and constantly creating different objects from the same piece. The plasticine itself will always remain the same but the object created will always be in accordance with the child’s imagination. This is the illusion. Everything on the Earth plane is comprised of matter, which is concentrated energy. The energy will always be constant, but the scenarios of people’s lives will always be a product of their thoughts. Thoughts are very confusing and changeable; therefore the illusion will change too. This is why some people appear to go from disaster to disaster throughout their lives. Chris just informed me he’s had to take his book off amazon. The editor he’s been working with has decided to accept one of the stories he’d included in his book. I’m hoping this is only a temporary thing and when it’s back up there, I’ll put the word out. I had the chance recently to sit down and speak with Chris Hanna, fellow Writer’s Ink member and author of In A Flash. In my early teens I really started to read a lot of books. I fell in love with science fiction and read every sci-fi novel I could get my hands on. Since my family did not have much money we usually picked up books second hand at flea markets or yard sales for a quarter each. Due to the age of the books I mainly read from the golden age of science fiction; Isaac Asimov, Frank Herbert and Robert A. Heinlein. Loving to read such fascinating and thought provoking speculative literature eventually led to the idea that I could do it myself. It was a decade later before I actually took the first step to do what it takes to be a writer, write. I thought I wanted to be a science fiction writer. In actuality I am a speculative fiction writer. The difference being that instead of creating a story around the science, you write about people and a ‘what if?’ scenario to advance the plot. For example; Robert A. Heinlein asked what if a human child was raised by martians? Would that person in fact be human since their thoughts would inherently be alien? The result was “Stranger In A Strange Land.” Probably the most recognized Heinlein novel. I’m afraid I am not educated enough to write hard science-fiction so I am more comfortable writing speculatively. I realized long ago that my writing is innately morbid. Because I have a proclivity for the morose I have tried my hand at horror writing. It is fun because I do not have to try and hide the darkness. I can let it run free! Speculative fiction, definitely. It is my first love. What made you decide to self-publish your collection of flash-fiction and poetry? To test the waters. The work was sitting in my folder gathering dust and was probably never going to be used in a regular market. Flash-fiction is a growing trend in Internet story telling and I wanted to try self-publishing. The hardest part was figuring out how to create the document. After much research and lots of trial-and-error “In A Flash” finally came to be. You mentioned being approached by a publishing company for your short stories after seeing some of your posts on FB… how did that work out for you? I find out today (July 20th, 2011) if McGraw-Hill Ryerson will be sending me a contract. I am just waiting to hear from the editor if the education committee is happy with my submissions. I understand you belong to a writers’ group. What can you say about the helpfulness and support from being involved with other writers? I think I would have given up if it were not for the group. They are there when I need that extra push to keep going when the journey seems futile. I am very self-critical and I find I can ease up on myself when I receive such positive feedback and support from my peers. Do you have any advice for writers who might be contemplating the self-publishing route? My only advice would be to work hard at self-promotion. No matter how brilliant your self-published book may be, it is not going to sell itself. This entails a learning curve for folks such as myself who may be too humble for their own good. First off I have to admit I’m a 60s junkie. I love the British TV programs Heartbeat and The Royal so the fact that Joanna Lambert’s book takes me back there was a bonus. When Tomorrow Comes follows Ella Kendrick on her rollercoaster journey from being a young girl to a young woman. Joanna paints her scenery vividly. The farm where Ella lives with her grandparents in the west of England is brought to life from the old farmhouse to the other buildings on the property. I could see the rural village of Meridan Cross and the nearby town of Abbotsbridge as clearly as if I was standing in the middle of them. The characters are complex, each with their own problems to deal with. Ella’s grandmother, a loving woman but one who has never come to terms with the fact her daughter walked out. Ella’s mother is a materialist social climber who likes to control everything, including Ella’s career path and who she will marry. The 60s era was one of change. Fashions went from longer skirts to micro-minis that barely covered your bum. Colours were bright and hair was long, especially on the guys. When titles of songs by the Beatles, the Rolling Stones, and other bands from back then were mentioned, I remembered them and started humming along. Joanna captured that time wonderfully. Overall, it was a wonderful read and I’m looking forward to the next two installments of the Behind Blue Eyes trilogy. 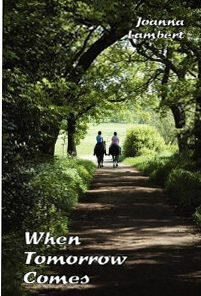 When Tomorrow Comes is available at amazon.co.uk in paperback for £9.99 for for the kindle for £4.54. This new author is featured on the loveahappyending.com site. You can visit her author page here. 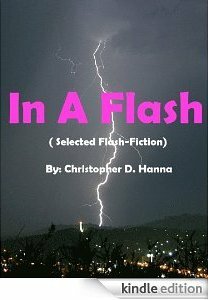 Fellow Writer’s Ink member, Christopher Hanna, has recently self-published a collection of his Flash Fiction and Poetry. You can download Chris’s book at Amazon.com for $2.99 US. I just finished reading the first of three novels in Joanna Lambert’s Behind Blue Eyes Trilogy. If this first book is any indication, books 2 and 3 should make for excellent reading, too. Now that I’m done, I’ll get started on my review and pass it on to Janice Horton our loveahappyending.com Review Chair.